The Client Catalog has several tools you can use to manage your relationsihps with your customers. While you may not want to develop relationships with all of your customers, it probably makes sense to track your top customers and make sense they keep coming back to your store. You'd be surprised to learn how much business is generated just by your top 30 customers. When you multiply the purchases of one customer over 5 years, you're looking at thousands of dollars of busiess that each one of these customers reprsent. That's a relationship worth investing in. You want to make sure your customers are happy and excited to keep visiting your store. This way you can see when the last time a purchase was made. In the example above, the last time Elizabeth Lopez made a purchase was February 12, 2001. If it's been more than 60 days since they made a purchase, consider sending your top customers a gift certificate or some sort of promotion that will get them back into your store. XpertMart™ offers two ways to make contacting a customer convenient. The first is by sending the customer an email, using the email button in the toolbar at the top of the catalog. Find the customer you are looking to contact in the Client Catalog. When you press the email button, a "compose message" window from your pre-defined email program such as Outlook, Netscape or Eudora will open up with the address that appears in the email field already written into the "To:" line. 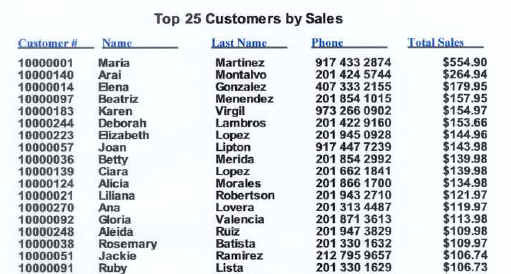 Alternatively, you can also print out a mail label with the customer's name and address. Find the customer you are looking to contact in the Client Catalog and then press the labels button in the toolbar at the top of the catalog. Make sure your label printer is plugged in and that the correct printer driver is installed in the Configure>Station Configure>Label Printer menu. If you want to be methodical about contacting your customers then you should use the Last Action and Next Action functions. These will allow you to regulate the frequency with which you are contacting your customers. Enter the date of the next time you want to contact the customer in the Next Action Date field and select the action you inted to take. (The options in the Next Action drop-down menu are the same as in the Last Action menu). If you want to contact your best customers once a month, then be sure the Next Action date is set to 30 days from the date of the Last Action. When the time comes to take the next action, you will want to change the date of the Last Action and reset a new Next Action date. In the example above, the Next Action Date is June 3, 2002 and the Next Action to take is send the customer a 20% off certificate. On June 3, assuming the customer was contacted, you will then want to set the Last Action date to June 3, 2002 and the Next Action date to July 3, 2002 (or a different date if it falls on a weekend). Select the new action to be taken from the drop-down menu. You can also use the Action Notes area to capture any specific comments regarding the customer and the action taken. If the customer no longer wants to contacted, you can set the Client Status to "Inactive". 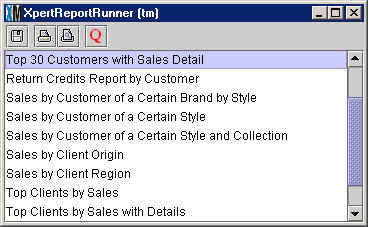 From the Client Catalog you can also run reports that show you which customers have bought a given Style, Brand or Collection in the past. If you are receiving a new shipment of Armani suits the following week, you can contact all of your customers who have bought Armani in the past and let them know. You could even have a by-invitation-only sales day so that your preferred customers get a first shot at buying coveted merchandise. Alternatively, these reports also come in handy when you're stuck with excess merchandise. Suppose you msitakenly ordered too many pairs of "Rodeo" cowboy boots. Before you mark them down 40%, you could first try contacting all customers who have bought Rodeo boots in the past and offer them a 20% discount. These reports will help you match merchandise to customers who have a special affinity to that merchandise.